Now that it is getting a bit colder, the birds have been busy chowing down at the feeder. I'm sure the suet and "gourmet" bird seed helps too! I spoil the birds! :) I'm so thrilled that t he Yellow-Bellied Sap-sucker (I've named him YeBeSaSu for short)has staked out the suet feeder as part of his territory, it is such a treat to see him. The photo on the right shows his "yellow belly". Fortunately, he is quite amicable with the other birds. A few years ago we had a Mockingbird that terrorized the other birds when they came to the feeder, he would fly from the neighbors' yard and frighten off any bird that came near "his" feeder. 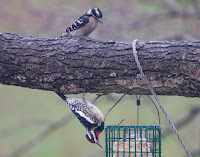 I get a kick out of watching the Hairy woodpeckers waiting their turn at the suet feeder while YeBeSaSu eats his fill. I'm surprised he's not as fat as a butterball, considering how often I see him out there! There are so many different kinds of birds, it is hard to keep up with all of them. 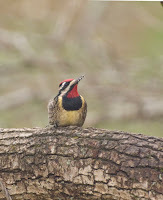 This video has the Sapsucker, a Hairy Woodpecker, Cardinals, a Nuthatch and a Tufted Titmouse. The Cardinal looks pretty mad! The little blue and white Nuthatches (right) are such funny little birds, I love to watch them scurry up and down the trunk of the tree. Often they will wedge a sunflower seed into the bark of the tree to crack the shell. All of these pictures were taken through double-pane glass, so they are not quite as sharp as I would like.